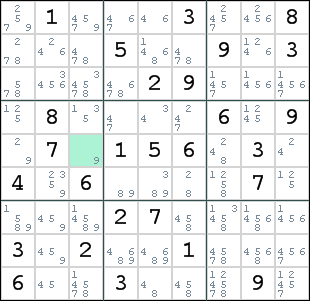 If you want to solve Sudoku puzzles, you need to learn some solving strategies. This guide will teach you how to solve a Sudoku either on paper, or using a computer program like SudoCue. When you are looking for a simple explanation of a specific solving technique, use the on-site glossary to locate the technique in this guide, or check the Table of Contents that follows this introduction. People are sometimes using different names for the same technique. The most common aliases are also present in the glossary. Our user forum is the best place to express your comments about this solving guide, but you can also use the contact form. Do not forget to include your email address if you want a personal answer. Your opinion is highly valued, and many of the strategies in this guide are the products of giants, whose shoulders have helped me see farther. 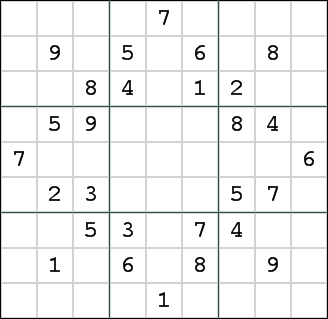 The basis of Sudoku is the “Latin Square”, which has been known for thousands of years, but regained popularity when the Swiss mathematician Leonhard Euler made a study of them. It was Euler who came up with the name “Latin Square”, since he used Latin characters as symbols. In Euler’s work, the Latin Square was not a puzzle but a mathematical phenomenon. Curiously, about the same time a French newspaper started to publish puzzles created from Latin Squares. The modern version started as a game called “Number Place”, in all probability designed by the late Howard Garns, and was first published by Dell Magazines in 1979. You can read more about this history on MAA Online. In this version, the 3x3 box constraint was introduced. This was an important improvement over the original Latin Square, resulting in more interesting puzzles. The puzzle was introduced in Japan by the publisher Nikoli in 1984, using the name “Sudoku”, which is an abbreviation for the original Japanese name “Suuji wa dokushin ni kagiru”, meaning “The Numbers must be Single”. Not only did Nikoli change the name, but they also introduced symmetry in their puzzles. The whole world adopted this new Japanese name, but in Japan, Sudoku is held as a trademark by Nikoli, so other Japanese publishers call it “Nanpure”, the Japanese translation of Number (Place). 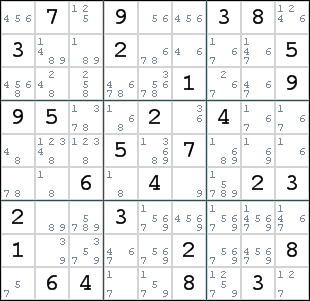 By the end of 2004, Sudoku appeared in The Times in Britain, brought to Europe by Wayne Gould, a retired judge from New Zealand and the founder of Pappocom. Many newspapers worldwide followed. Sudoku magazines can be found everywhere. Sudokus are published on the Internet on a daily basis. And many people have become addicted to it. It has already lead to the discovery of a new illness: CSS (Compulsive Sudoku Syndrome). 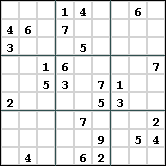 On the left, you see a typical Sudoku puzzle. 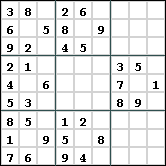 A Sudoku puzzle consists of a 9x9 grid, with a total of 81 squares. 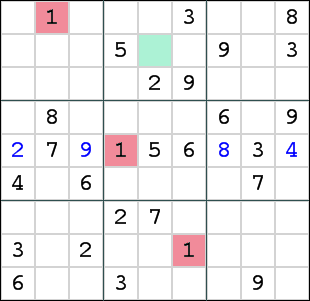 Different sized grids exist in variations on Sudoku, but these are not discussed in this solving guide. Each position in the grid is called a “cell” or “square”. A cell can be empty, or filled with a “digit”. This digit must lie between 1 and 9. Zeros are not valid digits. When used in a string representation of a sudoku, zeros represent empty cells. Despite the fact that numbers are used, there is no math involved in solving Sudokus. This is best illustrated by alternative versions, which use letters, colors, symbols or pictures. Digits are the easiest to communicate. A Sudoku made in Japan can be solved in Germany because digits are recognized all over the world. Sometimes people use the terms “number”, “value” or “symbol” for digit. The grid contains 9 “rows”. Each row contains 9 cells. They are numbered 1 through 9 from top to bottom, as seen in the picture on the left. Some people, especially those with a mathematical background, insist on numbering the rows from bottom to top. Others prefer to assign letters, calling them rows A through I. Make sure you are using the same coordinate system when you communicate with others about sudoku. 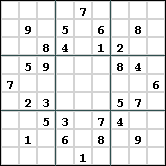 The numbering as used in this guide is the most commonly used system in the sudoku community. Programmers are the worst of the lot. They number their rows from 0 to 8. This guide is written by a programmer who has learned not to use this when talking to real people. The grid can also be divided into 9 “columns”, each containing 9 cells. The columns are numbered 1 through 9 from left to right. Chess players may be tempted to call them columns A through I, but I have never seen that in sudoku. 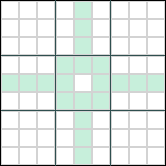 A third method to divide the grid is in 3x3 “boxes”, each containing 9 cells. Other names for these boxes are “blocks”, “nonets”, “regions” and “minigrids”. In discussions about killer sudokus, the term “nonets” is mostly used. I have adopted this name in the Killer solving guide. 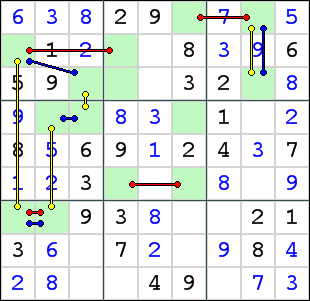 The boxes are often the victim in sudoku variations. 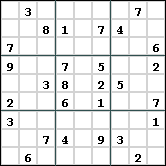 In jigsaw sudoku, the boxes still contain 9 cells, but they have an irregular shape. Rows and columns are used as the coordinates for the cells in the grid. A cell at row 3, column 5 will be addressed as R3C5. 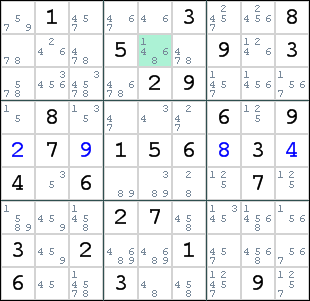 You may encounter Sudoku descriptions where the cells are addressed (X,Y), where X is the column and Y is the row. This is probably a more formal way to define cells, but may lead to confusion. Mathematicians also tend to number the rows from bottom to top, as in graphs. Attempts have been made to use a coordinate system with a combination of a letter and a digit as used in the game of chess. Again, confusion led to systems where the letters were assigned to the rows, and other systems with the letters assigned to the columns. The vast majority of the sudoku community has adopted the RnCn notation. This is what we will use in this guide. A number of digits are already in place. These are the “givens”. 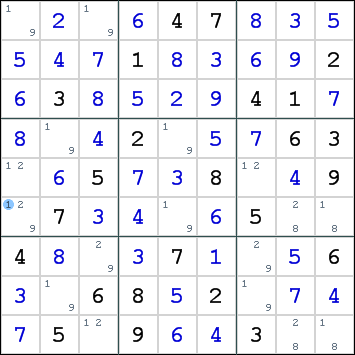 These givens are placed in such a way that there is only a single solution to the grid, otherwise, you are not playing Sudoku. You are not allowed to remove or change them, because they are part of the puzzle. Alternative names for givens are “clues” or “fixed numbers”. 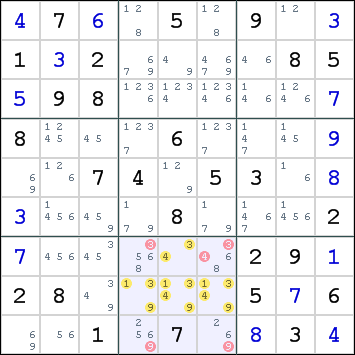 There is a search going on in the sudoku community for the minimum number of givens that a sudoku puzzle can have. 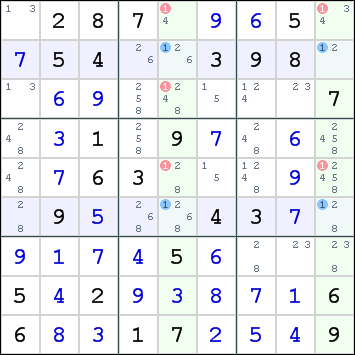 Currently, 17 is the minimum for 9x9 Sudoku. More than 36000 puzzles with 17 givens have been collected by G.F.Royle. The number of puzzles with 18 clues runs into millions. The number of givens does not reflect the difficulty of the puzzle. There are puzzles with 17 givens that can be solved easily, while there are puzzles with 28 clues amongst the toughest known. The placement of the givens and the information that you can extract from them is more important than the sheer quantity of givens. 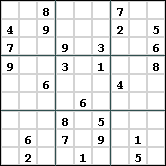 The Japanese publisher Nikoli limits its sudokus to a maximum of 32 givens. One can conclude, however, that a sudoku with more than 40 givens is probably not a very difficult one. Random puzzles generated by SudoCue usually have on average between 20 and 26 givens, depending on the type of symmetry used. There are people in the Sudoku community who think that a non-symmetrical Sudoku does not deserve the name. Others believe that symmetry is irrelevant and it is better to have a difficult asymmetrical puzzle than an easy symmetrical one. This debate will probably continue into the next century. It is, however, true that to enforce symmetry, it may be neccesary to add givens that would not have been required, had the symmetry demand not been there. It will still be possible to make very hard Sudokus with symmetry. Sometimes you can discover alternative forms of symmetry in hand-crafted sudokus. The sudoku on the left has no formal symmetry as a whole, but each box mirrors the ones next to it. 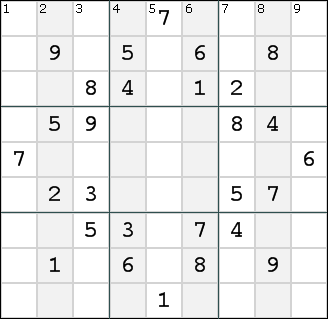 The sudoku on the right not only has reflection along the horizontal axis, but also shows fractal symmetry. The pattern of boxes that contain clues is repeated in each of these boxes. 180 Degrees Rotational symmetry is the most popular class. Most Japanese sudokus and many provided by Pappocom have this type of rotational symmetry. Maybe this popularity is related to the fact that the Yin-Yang symbol or “Taijitu” also shows this form of symmetry. For solving the puzzle, the symmetry serves no purpose. Only the location of the givens show symmetry, not the digits themselves. It is simply impossible to place givens on row 5 and column 5 that have symmetrical digits, because that would require 2 of the same digit in a single row or column. If you like to read more about this topic, I advice you to read the sudoku symmetry paper written by G.F.Royle. 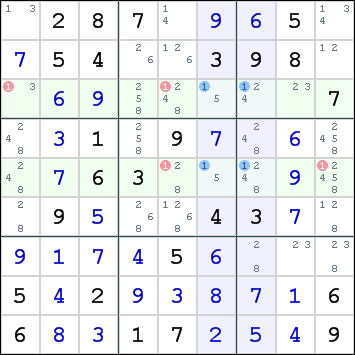 A valid sudoku has a unique solution. When you remove a given number, either the resulting puzzle still has a unique solution or the resulting puzzle has multiple solutions. 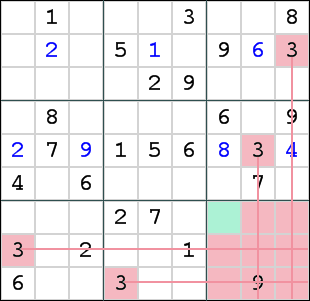 When it is possible to create a valid sudoku B from sudoku A by removing a digit, we call sudoku A non-minimal. On the other hand, if it is not possible to remove any of the givens and end up with a valid sudoku, we say that sudoku A is “minimal”. There is nothing special about minimal sudokus. It is simply not possible to make them more difficult by removing a clue. You can make them easier by adding clues. There is a field of tension between symmetry and minimal puzzles. To make a puzzle minimal, it is often not possible to maintain symmetry. A puzzle is said to be “Symmetrically Minimal” when it is not possible to remove a set of givens that keeps the symmetry intact, while maintaining a valid sudoku. 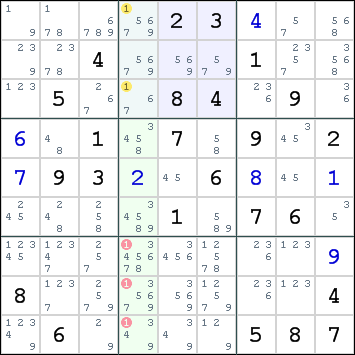 It has been stated many times: This Sudoku can be solved by logic alone. So where do you start? 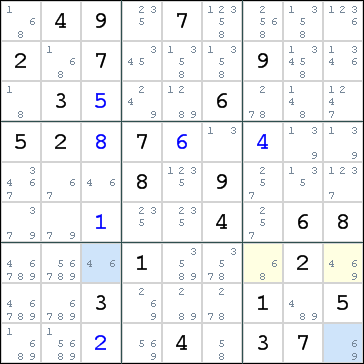 What exactly is the logic that can be applied to a Sudoku puzzle? This guide will tell you all about it. And we will start with Da Rule. From this rule we will build the set of techniques that use logic to solve the puzzle. The rule states that only one of each digit can be present in each row, column and box. If you’re only interested in solving sudokus, you might as well skip this section. 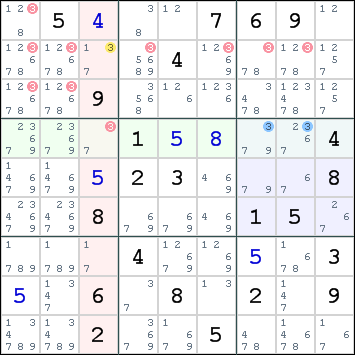 There are a few subjects in the world of sudoku that always result in fierce debates. I will not go into too much detail in this solving guide, but most of these controversies are about solving techniques. The feedback shows that these are indeed sensitive issues. To avoid negative sentiments, I have removed my personal views on these issues. Please use the forum if you like to discuss them with me. Many people say “No.”, but there are also people who believe guessing is a valid solving strategy. 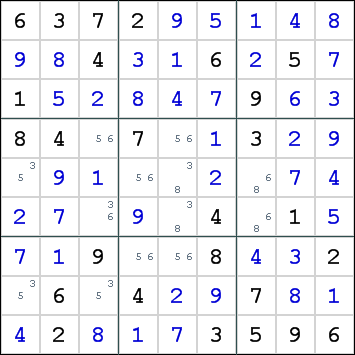 Almost any sudoku, even the most difficult, has a number of backdoors or magic cells which, when guessed correctly, allow the remaining puzzle to be completed with very basic strategies. Only recently a few puzzles were discovered that did not have any backdoors. The subject of debate is whether T&E is the same as guessing, or a logical technique. Outside the sudoku community, T&E is generally accepted as a problem solving strategy. When you solve a jigsaw puzzle (not the sudoku kind), you try to fit the pieces together and reject those that do not fit. 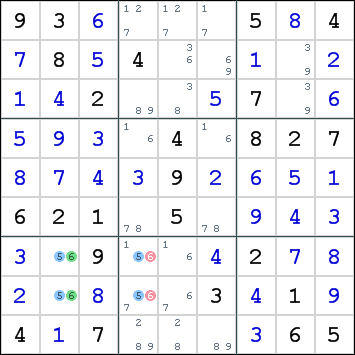 In sudoku, you try a candidate and reject those that cause an inconsistency in the puzzle. Same strategy. The question is: What to do when the piece does fit? Do we continue and try all the remaining pieces to make sure that this is the only piece that fits, or do we stop and use this piece? And when we choose the latter, wouldn’t that turn it into a lucky guess? This is a continuation of the Trial & Error debate. Unstructured Trial & Error has now been replaced by a version that only examines cases that have exactly 2 possibilities. All the issues of the T&E debate remain the same, but it is easier to test 2 alternatives in a limited set. Many generally accepted techniques, like XY-Wing and Color Wing are limited implementations of bifurcation. Other techniques like Forcing Chains and Tabling do not impose many limitations. It all depend on what a human player accepts as a useful technique. Opinions differ. This subject is the most controversial of them all. Many heated debates have been held on uniqueness. In mathematics, it is not uncommon for a problem to have multiple solutions. Even when a problem has a single solution, proving this fact is part of the problem. 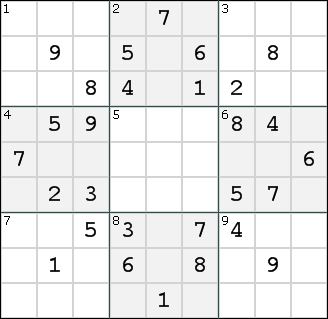 However, sudoku may look like a math problem, but it is a merely a puzzle for entertainment. When the maker claims that this puzzle has a unique solution, why should we question this claim, and not use it to our advantage? A dilemma arises for the supporters of uniqueness based solving techniques, because the arguments to support these methods can also be used to defend guessing as a valid technique. For many, that is not acceptable. This subject could also have been placed under the Sudoku Controversies heading. The difficulty level of a puzzle is in the eye of the beholder. Players have different skills, even when they have learned the same techniques. The relative difficulty of solving strategies is subject to personal preferences. Some cannot see naked singles without pencilmarks. Others find hidden subsets so difficult to spot, that they are not even trying to find them. There are many different rating systems. Most of them use simple terms, others use numbers, “stars” or other symbols. It is very difficult to classify the wide variety of puzzles in a few named categories. A scoring mechanism like I use in SudoCue is more accurate. Various measurements can be made, each adding to the overall score. How easy is it to spot a situation that you can use? Singles are easy to find. Patterns in the candidates can be found when you are able to filter your view to a single digit. Helper programs make pattern recognition easier with a filter tool. Subsets and chains are more difficult to spot, but with pencilmarks they are very visible. When there are many tricks to be found in a grid, the chance to spot one of them greatly increases. Even completely different techniques can compete for attention. A human solver is simply scanning the grid for anything that will work, unlike a computer program that scans the grid one technique at a time. Alternatives only come into play when the same search style is used. When you check the pattern for a digit, you may spot a set of locked candidates, alongside an X-Wing. Chances are slim that you stumble upon a naked triple during this search. When you scan pencilmarks for naked singles, you may also find the occasional pairs, triples and even unique rectangles. It is obvious that more alternatives make a puzzle easier. This measurement is also known as the solving path width. Each solving strategy requires time to learn. Some players are willing to invest time in learning all kinds of techniques, others are satisfied with a basic “toolkit”. This takes the shape of a pyramid, with only a few players at the top with the full arsenal of techniques. The thresholds are often set by the major puzzle manufacturers. A Pappocom Hard is the limit for many players. A single very advanced step in an otherwise low rated puzzle is very difficult to classify. 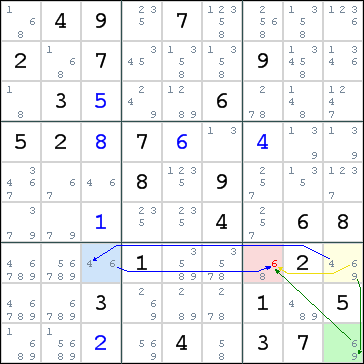 Such skewed puzzles often do not make it to publications, but they are excellent examples for learning certain techniques. This aspect of difficulty is heavily underestimated. Solving steps that naturally follow each other can cause a significant drop in difficulty. 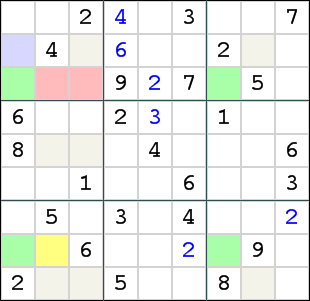 This is often seen in handmade sudokus, where the maker deliberately builds a consistent flow in the puzzle, with the occasional twists and turns. When find yourself in a series of “when I place this here, then that goes there” steps, you are going with the flow. A flow can follow all placements of a single digit or complete a house in a series of interlocked steps. There are a few concepts that you need to learn before we continue. Without these, it would be impossible to write a sudoku solving guide. You now have read the phrase “row, column or box” a couple of times. This is because a lot of logic deals with all types of grid divisions. From now on, we will use the term “house” when refering to any group of 9 cells that must all have different digits. Other terms for house are “group”, “set” and “unit”. 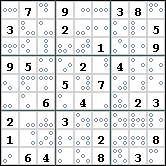 Mathematicians, who look as Sudoku as a Constraint Satisfaction Problem (CSP), call it a “constraint”. In this manual, we will stick to the term house, but you will recognize some of the other terms in the names of a few solving techniques. As a result, it is clear that there is a strong relationship between the cells in a house. This is so important, that we have given a name to that relationship. There are 9 cells in a house. Every cell is related to the 8 other cells in that house. A cell is a member of 3 houses: a row, a column and a box. 2 cells in the box are also a member of the same row, and 2 cells are also a member of the same column, leaving 20 cells in total that share one or more houses with any other cell. We call these 20 cells the “peers” or “buddies” of that cell. You could also say that the cell can “see” those 20 cells. The diagram shows all the peers for the center cell, named R5C5. When R5C5 contains a digit, it has an effect on all peers. None of those 20 cells can contain the digit that is placed in R5C5. This is what we call forward reasoning. It starts from a placed digit and looks at the effects that the placement has on the peers. However, when the cell is empty, we can reverse the logic. We start with the empty cell and scan the peers to determine what digits it cannot contain. Whatever remains can be placed in the cell. You will have to learn looking at the grid in both directions. It is the most important tool for a Sudoku solver. You will be able to practice this again and again, so don’t worry if you are not really familiar with it yet. When a cell contains a digit, there is yet another conclusion to be drawn, so obvious, that many people overlook it. The cell can no longer contain any of the other 8 digits. This conclusion is useless for the filled cell itself, but very useful for each of the houses the cell belongs to. There is one more word that you need in your vocabulary before we start with the first solving technique. The “candidate” is a possible digit that can be placed in an empty cell. Sudoku players often use pencilmarks to keep track of candidates. Left of this text, you see candidates in small numbers. These numbers can be positional (like the keypad on your telephone) or anywhere in the cell. 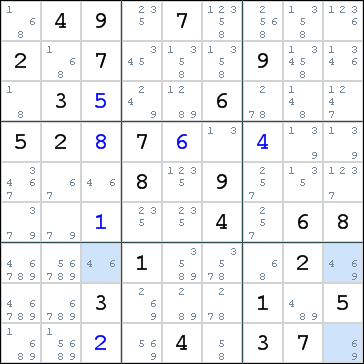 When the published sudoku is very small, there may not be enough room for these little digits. In that case, you can use positional dots or other types of marks. The picture on the right shows an example. In the SudoCue program, the Markup tool shows all candidates in little numbers. As you've seen earlier in this guide, you can use the peers to tell something about the candidates of a cell. With the peers you can “eliminate” candidates. The aim is to eliminate enough candidates so that only one remains. Some of the naming in sudoku solving will trigger the parental controls of your browser, but there is nothing indecent with these naked singles. They’re only digits. Take a look at the diagram. The green cell R5C3 is empty, so it needs a digit. To figure out what goes into that cell, we will first have to establish what cannot go into that cell. In order to do this, we have to examine the peers. In this picture, the peers that contain a digit have been highlighted in red. In fact, there is only one digit not used by any peer. Can you see it? It is digit number 9. This is the only candidate left for R5C3. It is called a "Naked Single". Other terms used are "Forced Digit" and "Single Candidate"
That, in essence, is the logic you use to solve a Sudoku. Eliminate the impossible digits until there is a single candidate remaining. You begin each cell with 9 candidates. When peers are filled, these candidates are eliminated one by one. At some point, 8 out of 9 digits are eliminated. The last candidate must be the correct digit. You can place it in the cell. This in turn will eliminate that digit in other peers. Though Naked Singles are easy to explain, they are not easy to find in a Sudoku. There are 81 cells in the grid, of which maybe 30 have a digit placed. This means that you need to look at 50 cells, check the 20 peers, and count the number of candidates remaining. Each time you found a single, the situation has changed and you need to start all over again. Many Sudoku players use pencilmarks to keep track of the remaining candidates for each cell. Not only are they an important timesaver in your quest for naked singles, but they are essential when solving more difficult puzzles where you need more advanced techniques. In SudoCue, you can use the Markup tool to maintain pencilmarks. This picture shows the same board with pencilmarks. This time, it is not very difficult to spot the naked single. When you are using a computer program that shows candidates like this, you are, in fact, cheating. Some players have such strong objections to pencilmarks, that they never use them to solve a sudoku. If you like to read more about solving sudokus without pencilmarks, follow this link. I’ve completed a few more cells in row 5 and arrived at this stage. Now check out the diagram. Can you say which digit is most likely to go into R5C7? Sure. This is not very difficult. Digit 8 is a naked single in R5C7. Furthermore, row 5 has a single empty cell and digit 8 is the only one missing. When a house has 8 filled cells, the last cell can be filled with the missing digit. This is a situation that we call a “Last Digit”. It is easily spotted by every player. You will not find them often in the early stages of solving the puzzle. In the endgame however, you will encounter lots of Last Digits. Technically spoken, Full House is not a separate technique. It is both a naked single and a hidden single which will be our next subject. 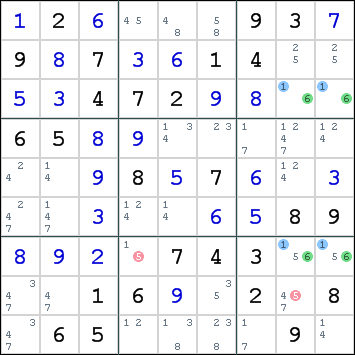 The number of cells that can be solved as last digit does have a strong influence on the difficulty of the sudoku, because they are so easy to spot and such excellent timesavers. You learned about Naked Singles and Last Digits. Now we will continue with “Hidden Singles”, the technique that usually solves 90 percent of the puzzle. A hidden single exists when there is only one cell left in a house that allows a certain digit. This sounds more complicated than it actually is. Remember what we’ve learned from Da Rule? Now check box 2 in the diagram. It does not contain digit 1, so one of the empty cells in box 2 must contain digit 1. 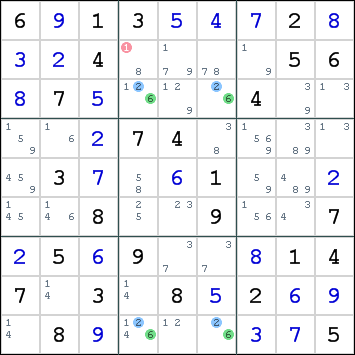 There are 5 empty cells in the box: R1C4, R1C5, R2C5, R2C6 and R3C4. Because R1C2 contains digit 1, no other cell in row 1 can contain digit 1. This eliminates R1C4 and R1C5. Because R5C4 contains digit 1, no other cell in column 4 can contain digit 1. This eliminates R1C4 (again) and R3C4. Because R8C6 contains digit 1, no other cell in column 6 can contain digit 1. This eliminates R2C6. The last remaining candidate in box 2 is R2C5, highlighted in green. Here is the same board with pencilmarks. Unlike naked singles, pencilmarks will not immediately reveal a hidden single. You have to check the candidates for all empty cells in the house to find it. In this case, R2C5 has 4 candidates. In some programs, a hidden single is called a “pinned digit”, as opposed to “forced digit” for a naked single. Sudoku theory is evolving in many places at the same time. Communities are forming fast and terminology, once firmly established in a community, is not easily replaced with another. This is why so many aliases exist for even the simplest Sudoku concepts. Please take another look at the pencilmark diagram. R2C5 is also a hidden single in column 5. When you are scanning the grid, you have the chance to discover the hidden single both in the box or the column. This does have an effect on the difficulty. This is a “floor”, the name we use for 3 boxes in a horizontal row. There are 2 placements for digit 9 in this floor, highlighted in yellow. All 22 candidates eliminated by these 2 placements are highlighted in red. Our attention is drawn to the center box. 2 of the 3 minirows are unavailable for digit 9, because of the placements in the outer boxes, which squeeze the 3rd digit into the last minirow at the bottom. In this minirow, 2 cells already contain digits 8 and 5. Now there is only a single cell left for digit 9, highlighted in green. The 3rd digit 9 can be placed here. Squeezing is a limited form of cross-hatching, which will be explained next. 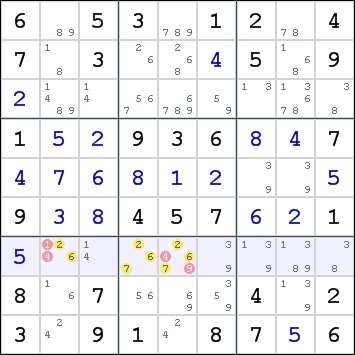 Because it requires this specific pattern, you will only be able to use this technique in a simple sudoku or in an advanced stage of solving. However, it is a very fast and easy to spot technique. When you have learned about locked candidates, you can combine the search for both, saving you a lot of time. You have already seen some examples of cross-hatching. You use it when searching for hidden singles. When checking a row, there are 9 columns crossing it. You only need to check those columns that have an empty cell in the crossing. There are also 3 boxes that have 3 shared cells with this row. The diagram on the left shows how to use cross-hatching to locate a hidden single for digit 6 in row 2. Row 2 has 4 empty cells, but 3 of them are out of commission for digit 6. This leaves R2C8 as the hidden single. You can use cross-hatching to check rows and columns, but many players use it mainly to check the boxes. In this diagram, cross-hatching is used on box 9. When rows and columns are involved, only a single candidate can be eliminated by a placed digit. Cross-hatching in boxes is more efficient. A digit placed on a line can eliminate upto 3 candidates in a box further down the line. Check for yourself how 8 out of 9 candidates are eliminated from box 9 by only 4 placed digits. Also, make sure you understand how to use cross-hatching. You can practice this with SudoCue by Shift-Clicking a cell. It activates the hatching lines for that cell. So far, we have only discussed singles. Although cunning puzzle makers are able to construct puzzles that require a lot of searching to find all singles, there is not much logic involved. If only singles were needed, Sudoku would not have attracted so many people. At some point, you need more than a sharp eye to solve a Sudoku. You also need a sharp mind, and the techniques to use with it. With “Locked Candidates”, we take the first step to a more advanced approach in solving these puzzles. The number strings above each image represent the initial state of the puzzle under discussion. You can copy this string and paste it into your sudoku program for some hands-on practice of the techniques explained in this guide. In most cases, you must do some basic solving to reach the point shown in the diagram. In this diagram, box 2 has 2 candidates left for digit 1. One of these two candidates must belong to the solution, otherwise we would be missing digit 1 in box 2. Both these candidates are located in column 4. Because we already established the fact that one of these two yellow candidates must be true, no other cell in column 4 can contain digit 1. The three red candidates have become obsolete and can be eliminated. The term locked candidates refers to the fact that these two candidates are locked in the 3 cells that form the intersection between a column and a box. This technique also works on the intersection between a row and a box. 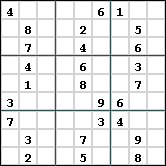 The technique of locked candidates was discovered by many Sudoku players at the same time. This has caused this technique to be known by many different names. Most commonly used are “Block-Block”, “Row/Column-Block”, “Line-Box Interactions” and “Pointing Pairs”. The last name is not fully accurate. There could be 3 locked candidates instead of 2. Locked Candidates often require pencilmarks to remember the eliminations. There is a case where you do not need pencilmarks, although you can still use them if you prefer to. 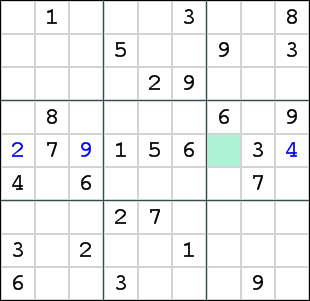 In this example, the blue marked candidates for digit 3 are locked in the intersection of row 4 and box 6. The remaining candidates for digit 3 can be eliminated from row 4. In this case, the only victim is in R4C3, which happens to be one of the last 2 candidates for that digit in column 3. As an immediate result, you can place the other candidate in its cell. That would be R2C3 in this example. It has a yellow marking. The other red candidates merely indicate the eliminations caused by this placement. Such a single unlocked by locked candidates is quite common. In time, you will be able to include it in your normal Cross-Hatching operations and no longer see it as a separate technique. An alternative variety of locked candidates can be seen in this diagram. There are 2 candidates for digit 2 in column 7, which I highlighted in yellow. Both those candidates are locked in box 9. Since one of these 2 cells must contain digit 2, no other cell in box 9 can contain this digit. This eliminates 6 candidates, the maximum you can achieve with this technique. 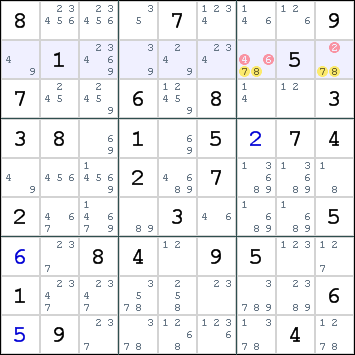 The general consensus in the Sudoku community is that the first type is easier to spot than the second when you are not using a computer program. Because these 2 types often appear together, you may think that type 2 is less common, but that is not true. You’re just spotting the type 1 before the type 2. Locked candidates of type 1 are very useful in cross-hatching. That is where the name pointing pairs originates from. The locked candidates point towards the candidates that can be eliminated. 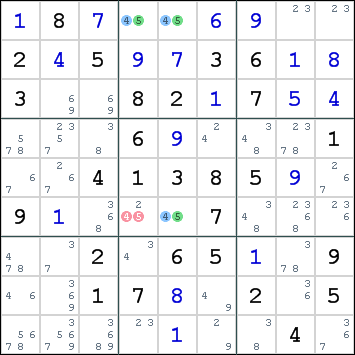 Experienced sudoku players consider locked candidates together with singles as the “basic techniques”, not worth mentioning in a solving report. This can sometimes upset beginners who are asking for help. To help you master this technique, here are a few more puzzles for you to practice with. So far, we have only looked at single digits. When a single candidate is left in a cell, we call it a naked single. When a single candidate for a certain digit is left in a house, we call it a hidden single. When 2 or 3 candidates of a single digit are found in the intersection of a line and a box, we call them locked candidates. Each time, single digits were involved. Now I will take you one step further and we will use multiple digits. In this section, you will learn how to recognize “subsets”. The term subset refers to “set”, one of the aliases for what we call a house in this manual. The idea behind subsets is to isolate some cells and digits from the others within a house. When you are solving a jigsaw puzzle, you are also creating subsets by separating the border pieces from the rest of the puzzle, or by sorting the pieces by color. Remember that awful pile of “blue sky” pieces that you always saved for the last? The isolated parts are sometimes referred to as “disjoint subset”. A disjoint subset contains a certain number of digits and the same number of cells that belong to a single house. Notice that the remaining cells and digits in the house form a complementary disjoint subset. It is even possible to split a house into 3 or 4 disjoint subsets, though you will rarely see it in regular sudoku. When both these conditions are met, a true disjoint subset exist and there is nothing you can do with it. The fun starts when only one of these conditions is true, because you are allowed to complete the disjoint subset by fulfilling the second condition. This almost sounds like magic, but mathematicians will surely recognize elements from group theory. Turns out that you are solving a math problem after all! When only the first condition is met, you have spotted a “naked subset”. You can then complete the subset by removing all candidates for the selected digits from the cells outside the subset. When only the second condition is met, you have found a “hidden subset”. Now you can complete the subset by removing all candidates for other digits from the cells within the subset. Now when you can find a naked subset in a house, the remaining cells and digits from that house will form a complementary hidden subset, and vice versa. This gives you a second chance to spot a subset. Let’s examine some real examples after this piece of dry theory. To spot subsets, you need pencilmarks. Pencilmarks are turned on in SudoCue by pressing key M, or by selecting the Markup tool from the menu. We will start with the subsets that are easiest to recognize: naked pairs. Check the following diagram. A naked pair is highlighted in yellow. The two cells R2C3 and R3C3 only carry the candidates 4-8, marked in yellow. This fulfills the first condition for disjoint subsets. You can also look at this from a more pragmatic perspective. To complete these two cells, you can only use digits 4-8, so these digits cannot go anywhere else in box 1 and column 3, of which these cells are both a member. You are now allowed to complete the subsets by removing all candidates for digits 4-8 outside these 2 cells. This can be done in box 1 and column 3. The candidates that you can remove have been marked in this picture. A naked single in R4C3 is the immediate result. When you examine row 4, you will notice another pair: R4C4 and R4C6 with digits 2-8. However, the remaining cells in row 4 do not have any candidates left for these digits. This is already a completed subset and there are no reductions available. The pair with candidates 3-5 in row 6 is also complete. It is the complete remaining set for both row 6 and box 6. Naked pairs can often be found at the intersections of lines (rows or columns) and boxes. Sometimes you have the choice to handle the situation as either locked candidates or as a naked pair, resulting in the same reductions. In SudoCue I call this a “Locked Pair”. When 3 cells in a house only have candidates for 3 digits, then there is a Naked Triple in that house. In row 3, there are 3 cells with candidates for digits 4-7-9. When any of the remaining cells would contain one of these 3 digits, there would only be 2 digits left for 3 cells. This allows us to eliminate these digits from those remaining cells in row 3. All of these are perfectly valid naked triples. Please notice that 47 + 47 + 49 also forms a naked triple, but it immediately decays into a naked single 9 and a naked pair 4-7. As with pairs, naked triples can also occur in the intersection of a line and a box. Here is an example. The intersection of row 3 and box 2 only has candidates 2-3-9 available. This is what we call a “Locked Triple”. These are very powerful, to the extent that you may prefer to handle locked triples before you do any basic solving. When you gain experience, spotting patterns like naked triples becomes more easy. Some experienced players already regard subset techniques as basic solving techniques. With this, they upset the poor beginners even more. This diagram has a naked quad for digits 1-3-4-9 in box 8. A naked quad is considerably more difficult to spot than a naked triple. If I had not colored them, would you have spotted these 4 cells by just looking at the candidates? A quad also has more candidates that can be omitted. 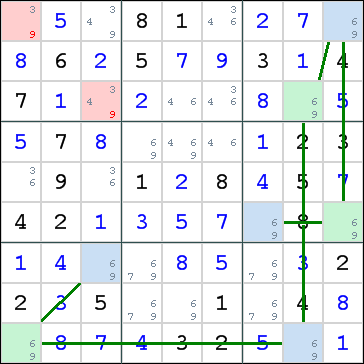 A quad consisting of cells with only 2 candidates each is extremely hard to find, and when required to solve the puzzle, severely increases the difficulty rating. Sudokus published in newspapers will usually not require any quads. Only the toughest puzzles in the Internet may require them, but they are very rare. So, what’s next? A quin? A 6-tuplet? There is no need to worry about subsets larger than size 4. Each naked subset has a complementary hidden subset that completes the house. 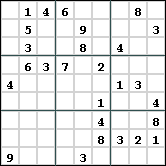 In a 9x9 sudoku, each house contains 9 cells, which can be split into 2+7, 3+6 or 4+5. For each subset larger than 4, there must be a complementary subset of size 4 or smaller. Our next featured item is a hidden pair at the intersection of row 2 and box 3. R2C7 and R2C9 are the only 2 cells in this row allowing digits 7-8. This satisfies the second condition for disjoint subsets. As a result, we can eliminate all other candidates from these 2 cells, completing the subset. You have learned that naked and hidden subsets are complementary, so what are the naked subsets in this diagram? Row 2 has a naked quin for digits 2-3-4-6-9. Box 3 has a naked quad for digits 1-2-4-6. This diagram shows a hidden triple in row 7 for digits 2-6-7. Like with naked triples, not all 3 cells need all 3 digits as candidates. Also, in this example only 2 cells have additional candidates that can be eliminated. Hidden triples and quads are almost impossible to find with the naked eye. It is more likely that you find the complementary naked quin 1-3-4-8-9. To complete this series, here is a hidden quad in row 4. Digits 2-5-7-9 only have candidates in 4 cells in this row. This leaves no room for other candidates, which are subsequently eliminated from these 4 cells. Fortunately, hidden quads are very rare, and there are several techniques that are easier to spot. If you find one, consider yourself lucky. If you need more practice finding hidden subsets, try the following puzzles. The first puzzle contains a hidden pair, a hidden triple and a hidden quad. The second puzzle solves very easily until you bump into a well concealed hidden quad. The objective of this technique is to isolate a number of rows and columns from the rest of the grid. Row/column subsets is a single digit pattern recognition technique. When you are using SudoCue as a companion with this guide, activate the Watch tool by pressing key W. This highlights all cells that allow a certain digit, making it easier to recognize these patterns. This technique also works when you swap the words rows and columns in the definition. N can be 2, 3 or 4. Larger values of N are not required, because each row/column subset has a complementary subset of size 9-N. The name “X-Wing” was coined by Wayne Gould of Pappocom. A programmer using the nickname “Rubylips” added “Swordfish”. I cannot trace the origins of “jellyfish”, but after that, the fish association of this technique was firmly established, which prompted me to use the term “seafood”, which is still used by many players. I would like to draw your attention to the cells with candidates for digit 1. When you look at rows 2 and 6, you will notice that these 2 rows only have candidates in columns 5 and 9. In the diagram, these four candidates have blue marks. There are only 2 ways to place digit 1 in rows 2 and 6. In both cases, both columns 5 and 9 will contain digit 1. The remaining candidates for digit 1 in these 2 columns have become obsolete and can be eliminated. They have been marked in red. The X refers to the fact that the candidates can be placed in opposite corners of the rectangle, forming a \ or / connection. Currently, X is often used in the names of single digit techniques. This is the same situation as in the previous diagram. There is a second X-Wing in the columns. All candidates for digit 1 in columns 6 and 7 are confined to rows 3 & 5. This time the rows can be cleared of the remaining candidates. As I have mentioned earlier, each row/column subset has a complementary subset. In this situation, both X-Wings also expose a hidden single for digit 1 in R1C1. X-Wing is a very popular solving technique. It is not too difficult to spot, certainly easier than hidden subsets. When you are only solving sudokus from newspapers, you can probably stop reading here. 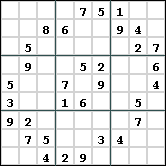 Most sudoku puzzles published in print can be solved with basic techniques, and rarely require more advanced techniques like subsets and X-Wing. Only a few go beyond that level. 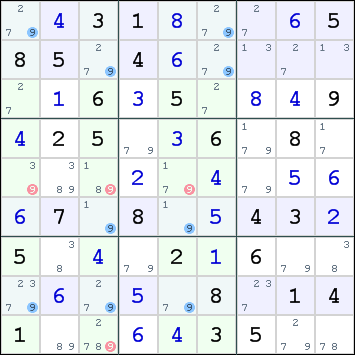 The sudoku program by Pappocom would rate these sudokus “unfair”, but for advanced solvers like us, this is where the fun really starts. Follow me! Row/column subsets of size 3 are known as “Swordfish”. This diagram shows a Swordfish for digit 7 in rows 1, 5 & 8. All candidates 7 for these 3 rows belong to columns 2, 4 & 6, as shown by the blue marks. Without the aid of colors, this Swordfish is not so easy to detect, especially since not all 3 rows require a candidate in all 3 columns. This is a similar to the problem spotting naked triples. After removing the remaining candidates for digit 7 in the 2 columns (the candidates marked in red), this puzzle contains a naked single in column 2. You will not find yourself so lucky in the more difficult puzzles. Often you have to chip away candidate after candidate until an opening presents itself. Earlier, people assumed that a Swordfish could only have 2 candidates in each defining line. This also explains the name, because a Swordfish is named after the Fairey Swordfish, a biplane used in World War II. With 2 candidates on each line, the pattern looks like 2 rectangles connected at one corner, like the silhouette of a biplane. This limitation is no longer considered necessary. There can be 2 or 3 candidates on each defining line, although it is hard to find a Swordfish with all 9 candidates present. There are 2 sides to every fish. This is the same diagram, only the colors have been altered. A Swordfish can exist in the columns too. In this grid, the Swordfish we previously detected in the rows is complemented by one in the columns. This Swordfish eliminates the same candidates, so it does not matter which of the two you discover first. After the eliminations have been made, you have completed the isolation of the two subsets of 3 rows and columns each and the complementary Swordfish will not yield any results. A Swordfish in the columns is usually a little more difficult to spot than one in the rows, but in this particular case, the equal spacing favors the Swordfish in the columns, as we are more accustomed to notice regular patterns. This complementary Swordfish has that typical biplane silhouette, with 2 connected rectangles. Connect the blue candidates and you will see what I mean. I can imagine why someone, who spotted this pattern for the first time, named it “Jellyfish”. The many candidates form a pattern that resembles the many tentacles of the animal. A Jellyfish for digit 9 is present in rows 1, 2, 6 & 8. All candidates for digit 9 in these 4 rows are limited to columns 1, 3, 5 & 6. The remaining candidates in these columns can be eliminated. They are marked in red. With the support of color highlights, you can see the pattern more clearly, and you may also see where the complementary Jellyfish is hiding. Tip: Look at the remaining candidates for digit 9. Now that you know what to expect in the pond, there is a little fishing tip that I would like to share with you. When you examine the pattern for a digit, you should first check how many instances of that digit are still required. In this case, there is only one digit 9 placed, with eight remaining. If you are able to draw a line for each missing digit either horizontally or vertically in such a way that no two lines cross any of the remaining candidates, you are allowed to remove all digits not covered by a line. Isn’t that neat? This is a trick that you may even be able to perform mentally. Please notice that you are not allowed to draw a line on a row or column that already contains the digit. In this case, row 3 and column 9 must remain free. Look at the diagram on the left. This is the diagram that contains the Jellyfish that we caught earlier. See how we can place 8 lines in the grid that do not cross each other in a candidate. The candidates which can be eliminated (with a red background) are the same as with the Jellyfish. The candidates touched by a vertical line form a Jellyfish pattern and the candidates touched by a horizontal line also form a Jellyfish pattern. It does require a little training, but fishing with lines is much easier than randomly scanning the grid. Later on, you will see how the same technique, with only a small change, allows you to catch other, more elusive types of fish. “Connected Pair” is a concept that you know already, but now it is time for you to learn its name. Many solving techniques depend on connected pairs. In earlier techniques, you have come across the phrase “at least one of these cells must contain this digit” a couple of times. In locked candidates, in naked pairs, and with slightly different wording in X-Wing. A “conjugate pair” exists when there are only 2 candidates in a house for a digit. We also call this a “strong pair”. In this solving guide, I will use the name connected pair as a more generic term for each pair of cells for which we can say that at least one of them contains a certain digit. The conjugate pair is a special case. In a conjugate pair, only one of the 2 cells can contain this digit and the other will not. Each conjugate pair has 2 distinct states. To identify the two states that can exist for a conjugate pair, we can use colors, letters or other symbols. This is also known as the “parity” of the cells within the pair. Many use plus and minus symbols to identify the parity. In sudoku, colors are a more common means to identify parity, with upper/lower case letters as a reference. Time for a little practice. In this diagram, all candidates for digit 4 are highlighted in green. I have drawn connecting lines between each pair	of candidates that are the last two in a house. The last two in their row have a red connection, those in the column have a yellow connection and for the last two in a box I used a blue color. The conjugate pairs in row 7 and box 7 coincide. So do the conjugate pairs in column 8 and box 3. When this happens, both connections can be treated as a single connection. There is no additional benefit from having 2 connections for the same pair. It does not make the link any stronger. Several cells in the diagram are connected to multiple peers. R2C1 forms a connected pair with R2C4 within the row, with R7C1 in the column and R3C3 in the box. 3 is the maximum number of connections for a single cell, as it only belongs to 3 houses. When a cell has multiple connections, the parity of these connections is synchronized. Either the cell itself contains digit 4, or all cells that it connects to contain digit 4. 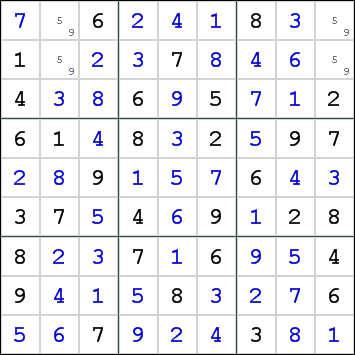 This is a powerful tool for the sudoku player. Now we will look at clusters in the candidate grid. A cluster is formed by all cells that are directly or indirectly connected. The clusters of size 2 and 3 cannot be used on their own. There are too few cells to work with. Therefore, we will focus our attention on the cluster of size 7. This cluster has a promising size. The parity of the cells within the cluster. This is the 7-cell cluster in isolation. To assign parity to each cell within the cluster, start with any cell and give it a color. Then follow the connections and make sure that the cells on both ends of each connection have different colors. In this picture, I have used red and blue, like the poles of a magnet, to highlight the opposite parities. What you need to remember is that either all blue cells or all red cells contain digit 4. There is no third option where neither of them contain digit 4. Within the cluster, each cell forms a connected pair with each cell of the opposite parity. We now return to the grid with the 7-cell cluster parities assigned. All cells that can see both parities of the cluster have a yellow background color. Only the candidate at R4C6 can be eliminated. This is not a spectacular result, as it could also be eliminated using the locked candidates technique. This does demonstrate however that different solving techniques can have the same results. It gives you a choice of alternative solving strategies for a single puzzle. 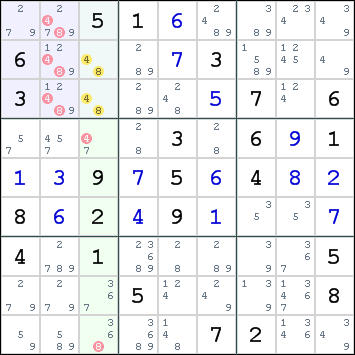 When you are stuck with a sudoku and ask for help, you will often receive many different answers. Players develop their own favorite strategies in time. So will you. In a couple of weeks you may have forgotten about connected pairs, because you are using alternative techniques that suit you better. You also need to understand that coloring patterns can change, so you may need to revisit this technique at a later stage. The elimination of R4C6 joins the 2 and 3 cell clusters into a single 5-cell cluster. In this diagram, there is a 7-cell cluster for digit 6. To distinguish the parities, I have used lighter and darker shades of green. You may use any 2 colors to identify parity. 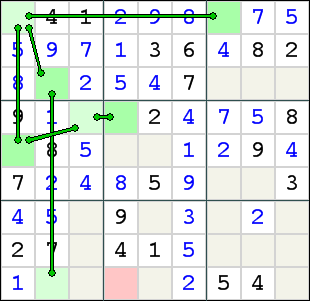 In the popular Simple Sudoku program, blue and green are often used. The most important thing to keep in mind is that either all the cells with one color contain digit 6, or all cells with the other color. Because each cell in the cluster forms a connected pair with each cell of the opposite parity, cells that can see both parities are caught in a trap set by the cluster. In this diagram, R9C4 can see R4C4 and R9C2 which have opposite parities and therefore are a connected pair. Either one or the other of those 2 cells contains digit 6, so R9C4 cannot. Sometimes a cluster of connected pairs is capable of destroying itself. This diagram contains a large cluster of 11 cells for digit 7. Parity is colored with green and blue. But there is something strange with this cluster. There are two cells in column 8 with the same parity. We know that all cells with the same parity must contain digit 7 at the same time, but if we choose the green cells, these two cells in column 8 would violate the prime directive. Now that we have established that these two green cells cannot contain 7, we can say that none of the green cells can contain digit 7, because it is not possible that some green cells contain a 7 and others not. In other words: The green candidates have eliminated themselves. How convenient. The only choice left is blue. You can now place digit 7 in each of the blue cells. I use the term “color wrap” for this pattern, because one of the two parities wraps around and sees itself. This pattern for digit 5 is known by many names. You do not need to memorize them all. Because the name “Color Wing” fits nicely in the series (Color Trap, Wrap & Wing), we will stick to that. For this particular configuration with two parallel pairs, the term “skyscraper” is commonly used. Do not misinterpret the yellow line in column 2. There is a third candidate in that column, so the green and blue candidates are not a connected pair. However, there is a relationship between these 2 candidates because they are peers. We have learned that peers cannot contain the same digit. Because column 2 can only contain a single digit 5, two of the candidates in that column will not contain digit 5. We can safely assume that either the blue or the green or even both of these colored candidates in column 2 will not contain digit 5. You may wonder why I am so strongly focused on these negative aspects. This is because both colored candidates in column 2 are connected to another candidate. I have drawn the usual green connector lines in the diagram. The linked candidates are R5C4 and R8C5. Because we know that at least one of the candidates they are connected to does not contain digit 5, we can conclude that at least one of R5C4 or R8C5 must contain digit 5. Please read this line again and again until it clicks. It took me some time too. Here comes the result: Because at least one of R5C4 or R8C5 must contain digit 5, any cell that can see both these cells cannot contain digit 5. Take another look at the picture. The three red cells fit this description. Candidate 5 can be eliminated from these three red cells. This may be the right time to introduce you to the term “shared peer”. When we examine two cells, all cells that are a peer of both these cells are the shared peers for these two cells. It is easier to say that candidate 5 can be eliminated from all shared peers. In Science and Sudoku, great discoveries are sometimes made simultaneously and independently by different people. The Empty Rectangle strategy is a perfect example. On December 25, 2005. Rod Hagglund wrote this topic in the Eureka forum, introducing his “Hinge” method. The next day, Håvard started a thread in the Pappocom forum, introducing his “Skyscraper” and “2-String Kite” methods. The thread continued for a long time, drifting on and off topic, but February 11, 2006, Håvard wrote this post about his “Empty Rectangle” observations. Even though his discovery was of a later date, the name Empty Rectangle was brought to a larger audience, and this name, including the convenient ER acronym, is now used by most players, except for a few die-hards in the Eureka forum. The key feature of an Empty Rectangle is a 3x3 box in which 4 cells in a rectangular formation do not contain a candidate for the digit we are inspecting, leaving an L, T or + shaped candidate pattern, known as the hinge. This is one of the few strategies that uses absent candidates. The 4 cells can be empty with only candidates for other digits, but may also contain other digits. It is important, however, that the box does not yet contain the digit we’re looking for. The candidates in A and B have a strong link, as shown by the red double-headed arrow. From earlier techniques, we have learned that we may eliminate any candidate that can see both ends of a strong link. The candidate in C can see A, but it cannot see B. Now the ER/Hinge comes into action. Like a prism, it can bend the line of sight through the box around the empty rectangle. The explanation is very simple. When B is true, all candidates in the vertical line through the box are eliminated. Due to the empty rectangle, one of the 2 candidates on the horizontal line must be true, thus extending the line of sight for B along that horizontal line. With the assistance of the ER/Hinge, C can now see both ends of the strong pair A and B. It can therefore be eliminated. The 4 cells that form the ER do not need to be so tightly packed as in the diagram, as long as all remaining candidates in the box are limited to one horizontal line and one vertical line. Also, you do not need all 5 remaining candidates in the ER box to be present. A box with only 2 candidates on different rows and columns can already be used as an empty rectangle. Please note that when all candidates are confined to a single row or column within the box, you missed an easy Locked Candidates move that would have eliminated either B or C.
This diagram shows an Empty Rectangle for digit 1. The strong pair can be found in row 9. R9C2 and R9C8 are the only two remaining candidates for digit 1 in this row. Box 3 contains the empty rectangle in the yellow cells. In this example, the four cells are not tightly packed. Three of them contain another digit, and the fourth does not allow candidate 1. R2C2 is the target for elimination. It can see R9C2 directly, and R9C8 using the line bent by the empty rectangle. On these grounds, we can eliminate candidate 1 from R2C2. In difficult Sudokus, Empty Rectangles are an important tool. Not only do they frequently occur in the simple pattern shown here, but also in more complex techniques like Grouped Coloring. If you want to practice the empty rectangle, you can work on the Daily Nightmare of August 25.
Credit for the discovery of Remote Pairs goes to Andrew Stuart of Scanraid. It is one of those techniques that offers a simple alternative for a more complex technique. In the case of Remote Pairs, it also combines the eliminations for two separate digits, effectively shortening the solving path. Naked Pairs are a common feature in a Sudoku puzzle. If you did not skip any lessons, you have already learned about them earlier in this solving guide. When one of the cells of a naked pair is also a member of a second naked pair, you can link them together in a chain, like strong pairs in a color chain. This diagram has several cells, which form naked pairs for digits 6 and 9. The green lines show how they are linked together. We can now use colors to show the parity of each cell in the cluster. When one of the green cells contains digit 6, all green cells will contain the same digit, and all blue cells will contain digit 9. In the alternative scenario, all green cells contain digit 9 and all blue cells contain digit 6. The 2 red cells can both see a blue and a green cell. Because these always contain digits 6 and 9, the red cells cannot contain these digits. As a result, digit 9 can be eliminated from R1C1 and R3C3. 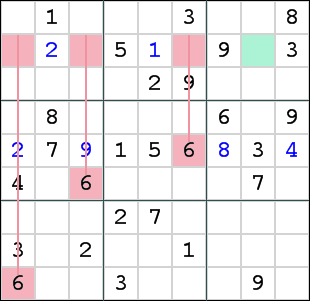 Remote pair eliminations are very rare in a Sudoku, but when they occur, they are very easy to spot. The same eliminations can be done with simple coloring, but that is harder to find and requires more work. 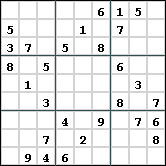 By the end of 2005, it looked like most solving strategies for Sudoku had been found. Then, in January, a mysterious person named Myth Jellies posted this message. A rag tag collection of solving strategies with a dozen different names could now be reordered and classified. And a few new discoveries were made on the side. The best solving techniques are those that use patterns. The player can learn how to recognize such a pattern, and then apply the effects (eliminations and/or placements) caused by that pattern. Patterns that are limited to a single digit are better recognized when we use the digit filters in our Sudoku programs. Most finned fish can also be replicated by Multi-Coloring, but this is more difficult than spotting a pattern. With finned fish, we are looking for a pattern that looks like an X-Wing, Swordfish or Jellyfish, but it has one or more extra candidates that spoil it. A popular term for such a pattern is almost fish. The technique allows us to eliminate the candidates that would be eliminated when either the fish or one of the extra candidates is true. This diagram shows the candidates for digit 3. The 4 green candidates are well positioned to form an X-Wing in columns 1 and 7. The only thing that prevents it is the blue candidate. Since that candidate is on Row 2, that must be an R2 unit trying to repair the X-Wing. There are 2 scenarios in this picture. Either the R2 unit stays in place or the X-Wing will be repaired. In both scenarios the red cells cannot retain their candidates for digit 3. They both share a box with the R2 unit and they are also on the victim list for the X-Wing. The yellow candidate escapes. It only falls to the X-Wing and we cannot be certain yet that this pattern will be effective. In our galaxy, the blue cell is called the “fin”. It must share a box and a defining line with the X-Wing. There can be upto 2 fins for an X-Wing. In this picture, R1C1 could also have been a fin. The new aspect in this technique is that a pattern can almost be present. When the pattern and the candidates that prevent it perform the same eliminations, you can always perform these eliminations. There are various patterns that can be used with this strategy. For some you have not even learned the original yet. The discovery of this technique can be traced back to June 2005, when Mat Newman found a pattern similar to X-Wing and somebody nicknamed Coconut suggested to use the name “XY-Wing”. I found this topic in the sudoku programmers forum as a reference. Later discoveries showed that alternatives for the rectangular pattern also exist. We will start with an abstract schema depicting an XY wing. The cell with the yellow background is the pivot. It contains 2 candidates that we call X and Y. The two cells with a green and blue	background are the pincers. One of them has candidates X and Z and the other has candidates Y and Z. The cell with a red background is the victim. The black arrows show which cells are each other’s peers. Because the pivot cell will force either of the two pincers to contain Z, the victim cannot contain candidate Z.
X, Y and Z can be replaced with any three digits. The pivot and the two pincers cannot contain any other candidates. The victim must contain at least one other candidate, besides Z. There can be more than one victim in a single XY-Wing. Here is an XY-Wing with 3 victims. I have used the same background colors for the pivot, the two pincers and the three victims. Here is the explanation: The pivot R9C3 only has candidates 3 and 9. When it contains 3, the pincer in R7C2 will contain digit 1. Alternatively, when the pivot contains 9, the pincer in R9C4 will contain digit 1. As a result, both pincers are a connected pair for digit 1. Either one or the other will contain digit 1. As we have been taught earlier, all shared peers of a connected pair for digit Z cannot contain digit Z. The cells with a red background are the shared peers. The green and blue arrows visualize peer relations that play a part in the two alternative solutions to this pattern. An XY-Wing with a single victim is quite common. Two victims can also be found on a regular basis in the more difficult sudokus. 3 to 5 victims are rare, especially when it is the only advanced step in the solving path. The discovery of the XYZ-Wing dates back to the beginning of August 2005. Sudoku historians should read Jeff’s introduction on the Sudoku Player’s forum. The XYZ-Wing extends the XY-Wing by adding the Z candidate to the pivot cell. This limits the power of the technique, because there can only be 2 victims for an XYZ-Wing, while the XY-Wing can theoretically have upto 5 victims. In practice, you will rarely find XYZ-Wings that cause 2 eliminations. This is the abstract schema depicting an XYZ-Wing. The cell with the yellow background is the pivot. It contains 3 candidates that we call X, Y and Z. The two cells with a green and blue	background are the pincers. One of them has candidates X and Z and the other has candidates Y and Z. The cell with a red background is the victim. The black arrows show which cells are each other’s peers. Because the pivot cell will force either itself or one of the two pincers to contain Z, the victim cannot contain candidate Z.
X, Y and Z can be replaced with any three digits. The pivot and the two pincers cannot contain any other candidates. The victim must contain at least one other candidate, besides Z. Here is a beautiful example of an XYZ-Wing. The pivot R7C9 only has candidates 4, 6 and 9. When it contains 4, the pincer in R7C3 will contain digit 6. When the pivot contains 9, the pincer in R9C9 will contain digit 6. When the pivot does not contain 4 or 9, it will contain digit 6. As a result, one of these 3 cells will contain digit 6. Therefore, the victim in R7C7 will be eliminated under all circumstances. With this technique, there is no connected pair, but a connected trio. The XYZ-Wing is currently the only technique that employs such a structure. Maybe the advanced techniques will expand in the future to discover more techniques with connected trios. Depending on your solver settings, you may discover an Aligned Pair Exclusion (APE) in R7C7 and R7C9. The same candidate is eliminated by this alternative strategy. There is a large overlap between these techniques, as you will learn next. After I claimed not to have seen an XYZ-Wing with 2 eliminations, a helpful forum member pointed out that one exists in the Nightmare of January 27. This puzzle will give you lots of practice in XYZ-Wings. An aligned pair is formed by two cells in the intersection of a line and a box. The line can be a row or a column. With this technique, all possible combinations of values for the pair of cells are examined. When a shared peer for the two cells exists with only 2 candidates, using that combination in the aligned pair would eliminate all candidates from that cell. Because of this conflict, the combination must be invalid and can be eliminated. After checking all combinations, we can eliminate all candidates that are not used in the remaining combinations. This is a hard to spot, laborious and complex technique, which has a large overlap with easier techniques like XY-Wing and XYZ-Wing. Still, it deserves a place in your technique book. It introduces you into the world of subset counting and almost locked sets, and it is definitely easier to master than the complex chaining techniques. Here is a beautiful example of an Aligned Pair Exclusion. You may have seen this picture before. Of course, two cells that are peers cannot both have the same value. This quickly eliminates the combination 6-6. When the pair would contain the combination 6-4, all candidates for R7C3 would be eliminated, leaving the puzzle unsolvable. The combination 6-4 is therefore not allowed in the Aligned Pair. A similar situation exists with the combination 6-9 and R9C9. As a result, there are no combinations left with a 6 in R7C7. This candidate can therefore be eliminated, leaving digit 8 as the only remaining candidate. In theory, the pair does not need to be aligned, but to increase the chance of finding useful common peers, the alignment is a great benefit. The next best pattern would be a Nearly Aligned Pair, which uses 2 cells in a single floor or tower. Such cells have 6 shared peers in 2 different intersections. This technique has been added to the arsenal of SudoCue in release 1.5.1. Even before I implemented it, I decided to add an explanation to this guide, because it fits perfectly in this series of techniques. 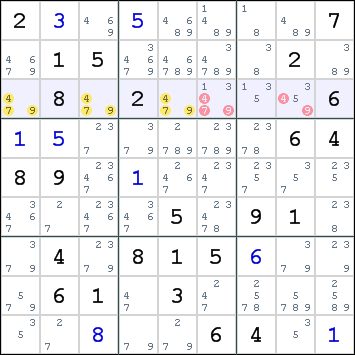 There are not many occasions where a single candidate grid can be advanced in the same way by three apparently different techniques. Later on, we will learn that these techniques are all based on the same principle. But let’s not spill the beans too soon. You need to learn about Almost Locked Sets first. To know about almost locked sets, you need to know what a locked set is. Actually, you already know that. It is an alternative name for a Disjoint Subset, which, as we recall, describes N cells with exactly N candidates. An almost locked set consists of N cells with exactly N+1 candidates. There is one candidate too many to call it a locked or disjoint set. The smallest ALS consists of a single cell with 2 candidates, also known as a bivalue cell. Such a bivalue cell can only resolve to a naked single. Because they are quite common, bivalue cells are often used in ALS strategies. When a set is formed by multiple cells, all these cells must be members of a single row, column or box. Because we can often find almost locked sets in an intersection, all cells are member of the same line and box. A single ALS does not help us much. It must be used in a chain or pattern to be useful. A simple pattern can be made from two almost locked sets. This is the ALS-XZ pattern. To make it work, we need to locate a “restricted common” digit X. This is a digit that cannot be in both sets at the same time, because all candidates for the digit in both sets can see each other. Here is a beautiful example of an ALS-XZ pattern. This picture may look a little familiar. The blue cell has 2 candidates 4 & 6, which makes it a single-cell ALS. The pair of yellow cells have 3 candidates 4, 6 & 9, so the pair is an ALS in both column 9 and in box 9. To avoid confusion in referencing the different sets, it is a common practice to name them with letters. In this example, we name the blue cell Set A and the yellow cells Set B. Digit 4 is restricted common, for it cannot be in both sets at the same time. The only candidate 4 in Set B can see the only candidate 4 in Set A. This is shown in the picture with the green line. As a result of the restricted common digit, either Set A or Set B will eventually lose this digit and become a true locked set for the remaining digit(s). The next step is to look for another digit which appears in both sets. We name this digit Z. Any cell outside the 2 sets, which can see all candidates for digit Z in both sets will be eliminated, because either Set A will contain it, or Set B will contain it, or both sets will contain it. In the example, R7C7 can see all cells in both sets that contain digit 6. Candidate 6 can be eliminated from this cell. The red lines show the lines of sight between this cell and the Z candidates in the two sets. ALS(A=[R7C39], B=[R9C9], X=9, Z=6) => [R7C7]<>6. By now, you have learned 3 different techniques, which eliminate the same candidate in 4 different ways using exactly the same cells as evidence. There must definitely be a common background for these techniques. Subset counting, up next, may be the answer. This technique is not implemented in SudoCue, and I may decide to leave it that way. It feels more like a theory behind the previous strategies, which are certainly more human friendly. Still, the theory is very solid and can, when studied by advanced solvers, yield more simple tricks, which in turn can be enrich your skill set. Subset Counting is not an easy tactic, because it works with any number of seemingly unrelated cells. This makes it very hard to spot in an actual puzzle. However, since every XY-Wing, XYZ-Wing, APE and ALS can be redefined using subset counting, it must be very versatile. Select any number of empty cells, and examine them as a set. For each digit that appears as a candidate in the set, count the maximum number of times it can theoretically be placed. This is the multiplicity of the digit. You can usually perform this count manually. You may also use templates. Add all multiplicities together. This is the total multiplicity of the set. I told you this wasn’t gonna be an easy technique. Maybe an example will help you understand how it works. Here is a beautiful example of a Subset Counting opportunity. You may experience a “déja vu” moment. Let’s examine the blue cells with subset counting. There are 3 digits which can be used as candidates. Digit 4 can only be placed 1 time, in R7C3 or R7C9. Digit 6 can be placed 2 times, in R7C3 and R9C9. When placed in R7C9, it cannot be placed anywhere else in the set. Remember, we are looking for the maximum number of possible placements. Digit 9 can only be placed 1 time, in R7C9 or R9C9. The multiplicity for the set adds up to 1+2+1=4. Now we must look for candidates that will lower the multiplicity of the set below 3, which means that we cannot place a digit in every cell in the set. It just happens that candidate 6 in R7C7 will eliminate all candidates for digit 6 in the set, reducing the total multiplicity by 2. This would indeed leave us with 2 placements in 3 cells. We must conclude that candidate 6 in R7C7 would cause an impossible situation and we can eliminate it, leaving a single 8 in R7C7. With subset counting, we now have 4 methods to make the same reduction with the same 3 cells as evidence. However, subset counting is the only technique in the series that has used all the evidence cells in a single set. This may not be significant, but it certainly helps to understand the whole picture. Subset counting is very powerful, but it is not easy to pick the cells that can be combined into a set. You must check all possible placements, which gives it a Trial & Error look and feel. However, once you have found the opportunity to use it, it is very simple to verify. It may also point you in the direction of an easier technique in the same category. Colors can be used to mark candidates that act as a group. 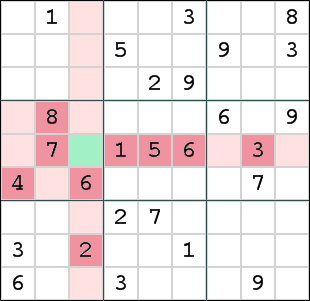 There are alternative marking systems, like David Bird’s Equivalence Marking, but in the Sudoku community, colors are often the tool of choice. So far, colors were only limited to the candidates for a single digit. Thanks to several people, including Bob Hanson who coined the name, we now have 3D Medusa coloring, which crosses the digit boundaries. When a cell has only 2 candidates left, one of them must be true when the other is false. This is exactly the same principle as a conjugate pair (2 candidates left for a digit in a single house). The bivalue cells are the gateways to connect color clusters for multiple digits. These larger clusters provide more opportunities for eliminations than single digit clusters. 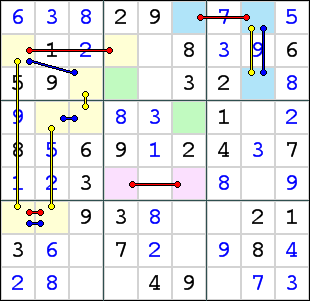 The Medusa techniques are also very useful to find Double Implication Chains (DIC’s) in the grid. You can always find a path from one end of the chain to the other using the alternating colors in a cluster. In the more advanced versions, you use the bridges to expand the chains to neighboring clusters. This is a first draft of the Medusa section. I am looking for some good examples to illustrate the technique. They will be added soon. This is the 3D version of the Color Trap. When a candidate can “see” both colors of a single cluster, then this candidate can be eliminated. In Medusa Coloring, there are two ways that 2 candidates can see each other. The first way is also used in regular coloring: they have the same digit and share a row, column or box. The second way is that the 2 candidates represent different digits for the same cell. This is the 3D version of the Color Wrap. 2 candidates with the same color can see each other. As a result, all candidates with that color are eliminated and all candidates with the opposite color can be placed immediately. Again, you also have to check the cells to see if there are 2 candidates with the same color. We start this Medusa Cluster by coloring all conjugate candidates for digit 3 with alternating red and blue colors. Digit 3 is the best place to start, because it has several strong links, and 3 of the cells only have 2 candidates. This gives us ample opportunities for expansion. Now check the cells with only 2 candidates. We call these “bivalue” cells. When one of the candidates is colored, the second candidate can be colored with the opposite color. Digits 5 and 6 are now added to the cluster. Expand the cluster by coloring the conjugates for each of the candidates added in the previous step. This adds five more candidates for digit 5 and also a candidate for digit 6. When new bivalue cells are added to the cluster, continue coloring until no more additions can be made. One more candidate for digit 6 is added to the cluster. At this point, a conflict is found, because the top row has 2 red candidates for digit 6. This invalidates all red candidates, allowing us to place the blue candidates in their cells. This is the 3D version of the Color Wing. 2 clusters with alternating colors are examined. When one of the candidates in the first cluster can see a candidate that belongs to the second cluster, a bridge is formed. Advanced Sudoku players call this a Weak Link. As a result, either of the colors opposite to the linked candidates must be true. They cannot both be false, because this would cause a conflict in the bridge. Now these opposite colors can also set a Medusa Trap. Any candidate that can see both these colors will be eliminated. This is a more complex version of the Medusa Bridge. It uses multiple clusters connected with a bridge. 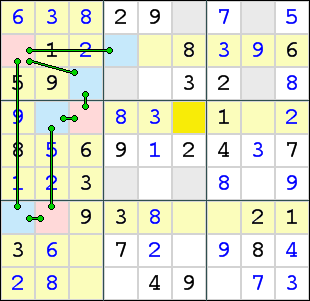 With this technique, you can find every Double Implication Chain in the grid. 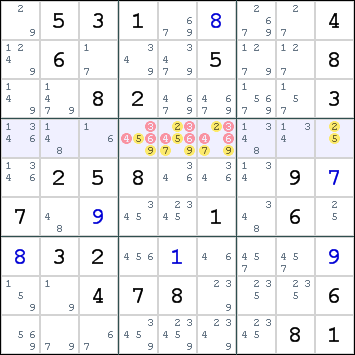 This technique assumes that the Sudoku you are solving has a unique solution. When you are not sure about this fact, you should avoid this technique. Assuming uniqueness is a controversial issue, as I pointed out earlier in this guide. When you prefer to prove the existence of a single solution, there are alternative techniques that can be used. 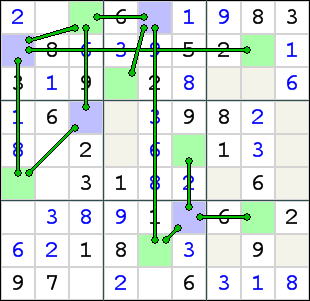 Usually, a grid with a BUG pattern also contains an XY-Wing or an XY-Chain. A contradiction can also be found with a 3D Medusa cluster. Recognizing a BUG may help you focus your attention to these techniques, so that you can still solve the puzzle without assuming uniqueness. The remaining players can follow me into the wondrous world of uniqueness-based logic. A situation in which every unsolved cell has 2 candidates and every row, column and box have 2 candidates for each unsolved digit. Here is an example of a Bivalue Universal Grave. It is useless to try and solve this puzzle. It has 2 solutions. When we place any of the remaining candidates in its cell, a cascading series of singles will follow, leading to one of two possible alternatives. The first alternative is a contradiction. In this case, choosing the alternative candidate will also cause a contradiction, leaving us with an unsolvable puzzle. To understand this, you must remember that all remaining candidates are strongly linked. When a contradiction has been found that forces 2 candidates into the same constraint, we can eliminate all the candidates involved, because they have the same parity. Since we already established that there are only 2 candidates for each constraint, we know that the remaining set does not have any candidate left for that constraint and can never completely solve the puzzle. Please forget this proof if it dazzles you. The second alternative is a solution to the puzzle. In this case, choosing the alternative will also lead us to a solution, because there are 2 candidates to satisfy each constraint. The diagram shows a BUG that can be solved in 2 ways. When you encounter a BUG pattern in a puzzle, you can be sure that is is either unsolvable, or it has 2 solutions. 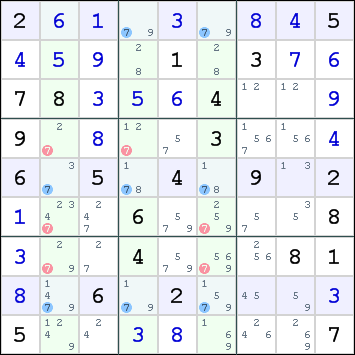 In a valid Sudoku, you will not encounter a pattern where every constraint has 2 candidates left. However, it is possible that you encounter a pattern that can be transformed into a BUG by a single move. These are interesting, because we can prove that either that move or the puzzle is invalid. At this point, we need to assume that the puzzle does indeed have a unique solution. Many puzzle makers (including me) guarantee that their sudokus have a unique solution. When you trust this claim, you can eliminate the move. When not, you cannot use the BUG technique. This diagram shows a grid that is dangerously close to a BUG. When we eliminate candidate 1 from R6C1, the remaining candidates form a BUG pattern, with 2 candidates left for each unsolved contraint. This pattern is also known as a BUG+1, because there is a single candidate that can save us from the BUG. 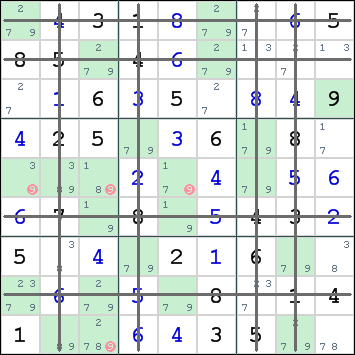 If we were able to eliminate candidate 1 from R6C1, the sudoku must either be unsolvable or have 2 solutions. 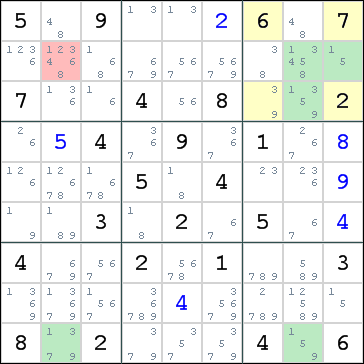 When we assume the sudoku is valid and has a single solution, then we cannot perform this elimination. The only way we can prevent it is by placing digit 1 in R6C1. After this placement, the puzzle is easily solved with singles. A BUG+1 is a pattern that is easy to recognize, because you only need to spot that there is a single cell with 3 candidates, while the remainder of the unsolved cells have 2 candidates each. The alternative XY-Wings or XY-Chains are more difficult to find. The simplicity of the technique is sufficient compensation for many players, who use it on a regular basis. In July 2005, some players were reporting an Unmentioned Logic Technique which triggered a debate that is still raging today. The new technique was soon known as Uniqueness Test. 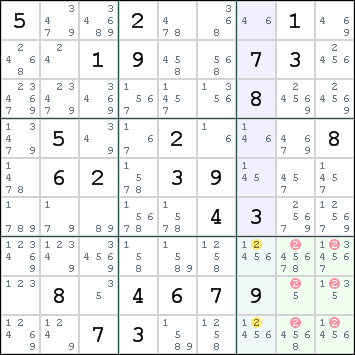 Like the BUG technique, the Uniqueness Test assumes that the Sudoku has a unique solution. Certain patterns in the grid can only occur when the puzzle has multiple solutions. Of these patterns, the Unique Rectangle (UR) is most commonly known. A wide range of solving tricks use the UR, either standalone or embedded in chains and loops. Needless to say that this puzzle has 2 solutions. The 4 cells in rows 1 & 2 and columns 2 & 9 can be completed in 2 ways. This is what we call a Unique Rectangle. It takes the shape of a rectangle of 4 cells, each with the same 2 candidates left. The cells occupy 2 rows, 2 columns and 2 boxes. The latter indicates that you will only find them in a single floor or tower. It is easy to mistakingly see 4 cells in 4 boxes as a Unique Rectangle when it satisfies the remaining conditions. Like a BUG, a UR can only exist when there are 2 candidates for each constraint. Actually, the name “Unique Rectangle” is not correct. It would have been better to call it “Non-Unique Rectangle”. A better name proposed by Mad Overlord is “Deadly Pattern”. This puzzle is clearly invalid, because it contains the Deadly Pattern. 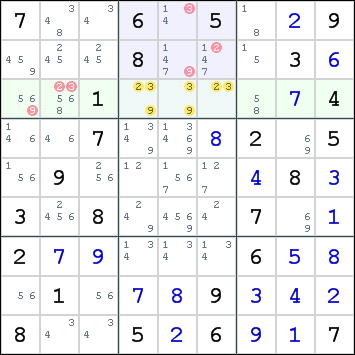 You will not encounter it in a Sudoku that has a unique solution. Any move that would cause a Deadly Pattern to appear must be an invalid move, or the Sudoku must be invalid. Again, it is a matter of trusting the puzzle maker that allows you to declare the move invalid. Using UR moves in an invalid Sudoku will cause unexpected results. Either the puzzle cannot be solved completely because you eliminated candidates that belong to the UR, or you will find only one of the 2 solutions and fail to notice that there is a second one available. The easiest and most common UR technique is the Unique Corner, also known as Uniqueness Test 1. In this case, only one of the 4 cells has one or more surplus candidates that do not belong to the Deadly Pattern. When there is a single surplus candidate, you can place it immediately. With multiple surplus candidates, you can eliminate the 2 candidates that would complete the Deadly Pattern. This diagram shows a UR in rows 1 & 6, columns 4 & 5. If we were to eliminate candidate 2 from R6C4, the remaining candidates in that rectangle would form a Deadly Pattern. Please verify that the corner cells occupy only 2 boxes. 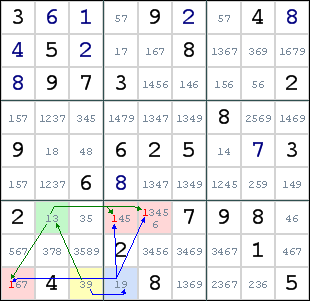 Since 2 is the only candidate that can save us from the Deadly Pattern, we can place it in R6C4, and the puzzle can be completed with singles only. This technique is rare, although it is not difficult to spot. In this case, the UR has 2 cells on one side with the same surplus candidate. Since one of these 2 must be true in order to avoid the Deadly Pattern, these candidates are locked in that side of the UR. The eliminations are similar to the Locked Candidates technique. This diagram shows a UR in rows 3 & 7, columns 8 & 9. The Deadly Pattern that threathens the unique solution contains digits 1 and 6. The 2 cells at the bottom of this rectangle each have a single surplus candidate for digit 5. If we would eliminate both these candidates, the Deadly Pattern would be formed, so one of these cells must contain digit 5. As a result, we can eliminate digit 5 from r7c4 and r8c8. Statistically, there is a 50% chance that the side will be in a single box, but in reality this pattern occurs more frequently in a side that lies within a single box. The single box position allows you to perform eliminations in both the box and the row or column, increasing the effectiveness. Here is an example that you can try for yourself. The unique side occupies 2 boxes and you can only eliminate a single candidate from that row. This technique is probably the most difficult of the UR series. It combines a UR with a naked subset for the surplus candidates. It is extremely rare and very difficult to spot. This diagram shows a UR in rows 3 & 9, columns 4 & 6. The Deadly Pattern contains digits 2 and 6. The 2 cells in column 4 have surplus digits 1 & 4. To avoid the Deadly Pattern, one of these 2 cells must contain one of these surplus digits. When we look a little further, we can see that r8c4 only has candidates 1 & 4. When r8c4 contains 1, one of the UR cells must contain 4. When r8c4 contains 4, one of the UR cells must contain 1. These 2 digits cannot be placed anywhere else in column 4. This allows us to eliminate digit 1 from r2c4. The 2 surplus digits are part of a naked pair in column 4. It is also possible to form a naked triple with the surplus digits and 2 extra cells. Currently, I have no example available. 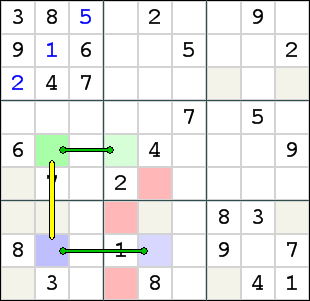 This technique clearly shows how you can expand the existing solving logic with Unique Rectangles. Compared to the Unique Subset, this technique is relatively easy, but it is equally rare. With a Unique Pair, one of the digits that belongs to the Deadly Pattern is strongly linked in the 2 cells with surplus candidates. As a result, we can safely eliminate the other digit from these 2 cells. This diagram shows a UR in rows 7 & 8, columns 2 & 4. The Deadly Pattern contains digits 5 and 6. When we look at column 4, which contains the 2 cells with surplus candidates, we can see that the only 2 cells with candidates for digit 5 are the 2 cells that belong to the UR. When we would place digit 6 in one of these cells, the other must contain digit 5 and the Deadly Pattern would be formed. As a result, we can eliminate digit 6 from those 2 cells. There are several other methods to use Unique Rectangles. Most of them use one or more strong links that restrict some of the digits, allowing us to eliminate others. These patterns are rare and not too easy to locate in the grid. Thanks for reading this solving guide all the way to the end. If you have found mistakes, plain lies, spelling or grammar errors or other inaccuracies, please report them on the contact form or on the user forum. I have invested a lot of time in this guide and it would be nice to keep it correct and comprehensive. This guide happens to be one of the most popular pages on my website. 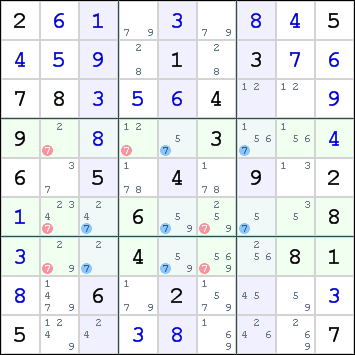 I am still learning a lot from scouring the forums and the other sudoku resources on the Net. 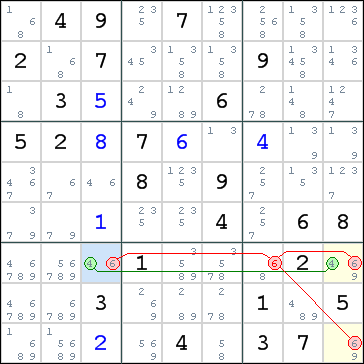 My work on this solving guide always lags a little behind the work that I do on SudoCue. I hope you can forgive me for that. Writing a piece on a solving technique is easier when I have implemented it in the program first.